Katie and Joe had treated themselves to a lavish dinner for their 1st anniversary. They had been friends since childhood and always found ways to keep themselves amused despite knowing each other for so long. Knowing that traffic was extremely likely on the normal route home, Joe decided to take the deserted long way home, through a dense forested area. After about half an hour the car slowed to a stop. Looking over at Joe, Katie knew he was being mischievous and gave him a stern look. "Come on Joe, I want to go home, don't you start" she scolded. "Aww, come on! There's nobody around" he grinned. He leant in for a kiss but Katie pushed him away, "I don't think so, this may be our anniversary but I'm not about to get it on in your car" she laughed. "Oh fine, but you owe me" he huffed, jokingly. Turning the ignition to awaken the car once more, Joe looked puzzled when nothing happened. He turned it again but still, nothing. Rollin her eyes Katie said "Come on, this has been done to death. Get on with it". "Seriously, it won't start" Joe replied, demonstrating again that the car wasn't responding. 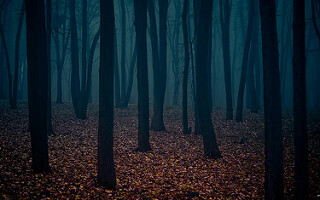 They were stranded in the middle of a wood with nowhere to go. Both checked their phones, Joe's was dead and Katie had no signal. After what seemed like an age, Joe declared that he was going to find the nearest petrol station or public phone. Getting her coat ready to go with him, Katie nodded. "No, you stay here and keep warm in the car" he said. "I'll be fine, I'm pretty sure there's a station about 30 minutes walk away" he reassured her. Agreeing to stay with the car, Katie lightly kissed her boyfriend on the lips and settled into the back seat of the car. Slightly tired, Katie decided to have a nap whilst Joe was gone. Tap, tap, tap. The distinct sound of tapping woke Katie up from her 'nap'. Looking at her watch, she discovered she had been sleeping for 3 hours. Puzzled that it had been so long without Joe returning, she peered out the window. It was night time and the density of the trees made it hard to see anything. Worried she climbed into the front seat and tried the ignition one more time, a fruitless attempt she knew but she wanted to at least try. She played a game on her phone for a little while having forgotten about how she had been woken. About 10 minutes after she began playing, the tapping noise had returned. Tap, tap, tap it went. Not knowing what could be making the noise puzzled her. Shining her phone out of the window, she saw that they were not parked underneath a tree despite the area they were in. The tapping noise came and went every few minutes. Getting quite worried, she locked the doors and stopped using her phone. 20 minutes passed before any noise returned, this time however, it was a scraping noise that she heard. This freaked her out, lying down in the seat as low as she could, she closed her eyes and prayed for the noise to cease. Knowing that something was wrong with Joe didn't help to ease her anxiety, if he had made it to a station he would have returned by now. It had been at least 5 hours since Joe had left and about 2 of enduring the strange noises around the car. She was trying to think of anything just to take her mind off the situation. The noise started up again but was interrupted with flashing lights. The light filled the car and Katie sighed in relief, Joe must have gotten help. "This is the police, stay right where you are" a loud voice sounded through the air. Puzzled, Katie wondered what on earth was going on. Unlocking her door she was greeted by a police officer looking pale. She looked around at the other officers and was immediately confused. They were all pointing guns right at her. "There must be some mistake, I've not done anything" she explained. "Just come with me, you're not in any trouble" the officer replied gently. Walking towards the cars with him he added "We're going to get you out of here but whatever you do, don't look back towards the car". Annoyed that he had said this, she looked like any normal person would. What she was greeted with made her throw up instantly on the muddy road. Right there on top of her boyfriend's car was a dirty man holding a bloody axe in one hand and her boyfriends severed head in the other. The noise through the night was him tapping on the roof with his axe. That is creepy, but why was the guy still on top of the car if the cops were there? Wouldn't they have shot him, or restrained him before getting her out? And why didn't he go after the girl in the car? hard u r so true coz he would of like cut her with his axe and y would he be on the roof?? ?